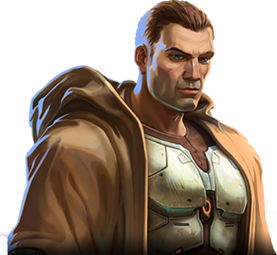 My Human Gunslinger is going to go, and be replaced by a Chiss Scoundrel, will be Laran's brother. But that'll be it. I've loved playing the healing Operative too much, and want to repeat it using Scoundrel, really gone off the gunslinger dps idea. I REALLY want one more slot though, as I want to create a Chiss Assassin Tank. Anyone else thought that this is a clever marketing ploy by BioWare .. to also introduce additional character slots for money, knowing that people already with 8 slots will be facing this dilemma? But we know for sure that there will be more slots available by buying them? I've tried scouring for information about additional slots, but I've not found any official information saying we'll get them, either free or paying for them. It certainly wouldn't surprise me if they offer a 'pay for slots' systems, but I think if they do, they'll be a lot of backlash for it! So far, they're not really catering for altaholics. I have been putting off making alts just because of this. I've ended up with 5 now anyway. Little miffed about having my first level 50 chars race cyborg and my next toon that is going to be 50 is human. Well, my fault for being boring. I sadly dug out a link last night at work with a summary from the guild summit, saying there's currently no plans to provide more character slots. But didn't Bioware hinted about combining different legacies in the future f.ex through marriage? Then one could in theory just get another account and bam! 8 more character slots to same legacy. Mmmm...I don't want to go down that route though, was bad enough when I ended up with three accounts on SWG! They'd still be better off offering an option to pay for more slots. I WANT IT NOW DAMMIT! It's not like if races have much difference, or as if their racial skills make any advantage. It's nothing to do with that...it's about aesthetics for one, and that I want room for an Assassin as well as Sorcerer on Empire side!